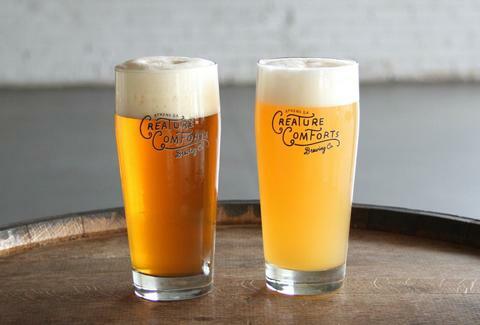 Tropicália is an IPA created by Athens-based brewery Creature Comforts. That's the first thing you need to know. It's a balanced and bright beer, with notes of juicy, tropical citrus and slight hints of pine. It’s ripe and refreshing. The can itself is easily spotted, featuring a sunny, bright orange tangerine set atop a crisp, cerulean blue ocean. You could, of course, drink it year round. But this beer was made for summer. Since its release in 2014, Tropicália has become known as one of the best -- if not the best -- craft beers from Georgia. Reviews on Beer Advocate describe it as “nearly perfect” and “paradise in a can.” On top of the verbal praise, it’s also earned a “world-class” score of 96. The only problem? Actually getting your hands on a six pack. This past fall I moved to Atlanta and had my first taste of Tropicália when a friend offered me a sip. I was impressed. So impressed that I decided to order a can of my own -- only to hear, much to my chagrin, the bartender trumpet to the entire room that they’d been completely sold out. Unfortunately, that’s business as usual for Tropicália. The cans fly off Atlanta shelves so quickly that beer shop owners have started hiding it in the back room. Grocery stores stash it behind cheese counters. There is, for all intents and purposes, a black market for the stuff, where only those in-the-know have access to the lauded brew. It's even been alleged that people will set alarms to alert them to the distribution truck arriving at their local purveyor so they can be first in line. Hard-to-find craft beer is not a new phenomenon in Georgia, but Tropicália’s rapid rise to popularity is rare for the Southeast, a region that’s traditionally less than hospitable to microbreweries (the nine states with the fewest breweries in the US are all in the South thanks to a potent combo of religious interests and government regulations). In fact, Georgia earned the title as the “worst state in the US for craft brewing” due to an antiquated law that prohibits breweries from selling beer to retail consumers, forcing them to use third-party distributors. In layman's terms, this means the beer is only available from the store and you can't legally purchase it at the brewery. Side note: The only other state with that regulation is Mississippi. People set alarms to alert them that the distribution truck is arriving at their local store. Despite those setbacks, Georgia now has more than 30 craft breweries. But while, say, a heavy-hitter like SweetWater is ubiquitous in beer stores and taprooms these days, the state hasn’t seen a beer become as big of an instant cult classic as Creature Comforts’ Tropicália. So to find out more about what makes this IPA so special, we turned to Creature Comforts co-founder and head brewer David Stein. The genesis of Tropicália started in a brewpub in Decatur in 2011. Stein was working as head brewer at Twain’s, playing around with making aromatic, less bitter IPAs and experimenting with fruit-forward character hops -- including Citra, Galaxy, and Centennial. He came up with the name Tropicália while at Twain’s, but it would still be a few more years until he left and co-founded Creature Comforts in 2014 -- when he finally perfected the formula. Add in the reality that Georgia is a state with a young craft beer scene, where small names can quickly become big players, and the pieces begin to fall into place. “People were excited to claim such a good beer as their own and to stand behind it in solidarity as a sign that a young Georgia brewery could make something just as good -- if not better than -- the IPAs from other bigger breweries,” Stein says. He also posits it’s Georgia's version of Bell’s Two Hearted (an extremely popular Michigan beer that was once voted the world's best IPA by RateBeer.com) and people around the area are immensely proud of it. Eventually, Stein explains, it was word-of-mouth and good press that finally helped get them on the map (that bright label wasn't hurting anything either). As demand rose, supply couldn’t keep up. And slowly, the complaints and frustration from consumers began to trickle in. But Tropicália’s disappearing act isn’t due to a lack of effort on Creature Comforts’ end. “We’re not purposefully not making enough to create this demand,” Stein says. Creature Comforts ships out about 300 barrels of Tropicália per week -- not a small amount (there are 13.7 cases in a barrel). Still, compare their overall output of 28,000 barrels per year to the 500,000+ barrels that SweetWater, the OG Atlanta brewery produces, and you’ll understand the scale you’re dealing with. 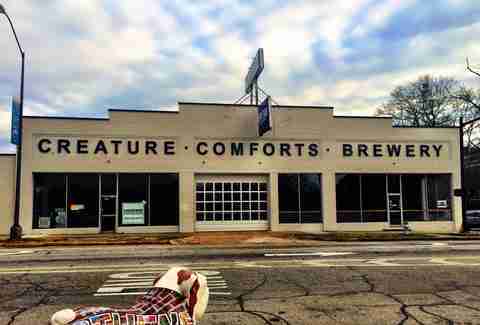 There’s also the fact that Creature Comforts is currently housed in a 13,000sqft building. They’ve simply maxed out space. Stein hinted at some expansion plans that he’s excited about for 2017, although he couldn’t (or wouldn't) go into details with us. We just focus on making good beer. And we're trying really hard. Until those furtive expansion plans become reality, ATLiens aren’t totally out of luck. 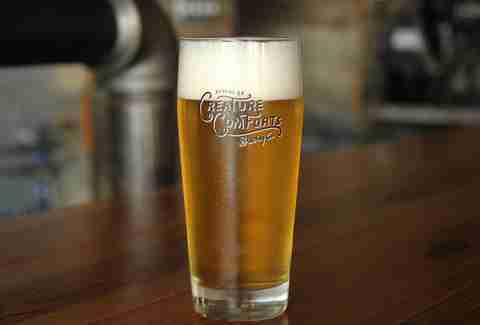 As a clever workaround to the law prohibiting retail sales, Creature Comforts hosts brewery tours, which can include a tasting and a “souvenir” -- aka a six-pack of beer to take home. “We’re not selling the beer; we’re selling the tours,” Stein explains. However if your grueling search for Tropicália turns up empty, you can always check out other Creature Comforts brews to quench your thirst. Stein recommends Cosmik Debris, their seasonal double IPA, or Get Comfortable IPA (Bonus: All profits from that beer go to Creature Comforts’ charity initiative to help people who are hungry, homeless, or in poverty in Athens). Locke Hughes is a freelance writer who usually covers health and wellness, but believes good beer plays an big part in that. Follow her @lockevictoria.